It doesn’t take much to get started. Over time as your interest grows so too can the bench clutter. Start with the basics. Minimally you will need a signal tracing instrument such as the Micronata unit shown in Figure 145. They typically sell for between $15.00 and $50.00 on eBay. Be sure you get one that is tested and works. 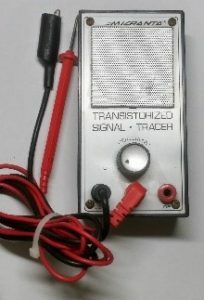 This is simply a battery-operated transistorized amplifier with a speaker, volume control and test probes. There are three jacks marks COM, AF and RF. Connect the COM to the ground (Common) circuitry in the set being examined. The AF input lets you track down audio signals or the lack thereof. The RF jack sends probe signals through a diode on their way to the amplifier, enabling you to detect radio signals in parts of the set prior to where they become audio. 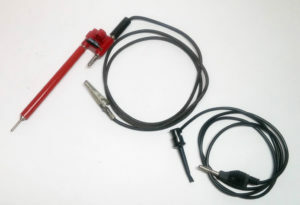 If the probes are missing you can easily buy or build replacements. These are getting old enough so that you might consider replacing the electrolytic capacitors within. It’s easy to do. A Tenma 72-540 tracer/injector combo. 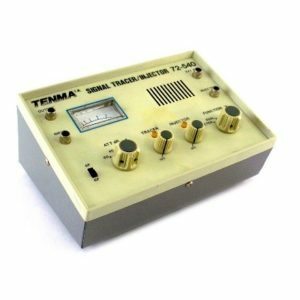 The Tenma 72-540 is a combination signal injector and tracer, and it has a meter so that you can see the effects of your work. They pop up on eBay from time-to-time for under $100.00. These often come without test leads, which you will then need to either buy or build. As you will see momentarily I changed the connectors on mine to accommodate better leads. 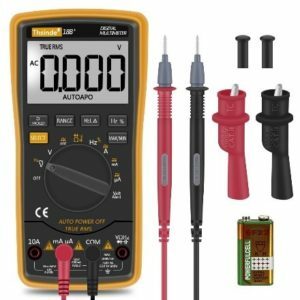 You will also want to own a good multi-meter capable of measuring at least AC and DC Volts, and Resistance (Ohms). There are plenty of other features found in multimeters these days, some of them helpful, others not so much. This is not a good place to skimp. There are plenty of meters selling for under $10.00. I would avoid them all. If you have the budget for a name brand such as Fluke it will probably be money well-spent. But if you prefer not to spend $100.00 or more, consider the TH036 sold by Amazon. 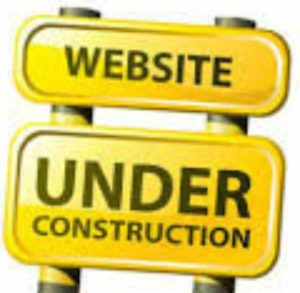 It has an impressive list of features, and routinely receives glowing reviews from users. As odd as it sounds, a working radio is a handy thing to have on the bench. Do you remember reading about oscillators Back in early chapters? Oscillators do fail occasionally, and you can use an expensive, bulky frequency counter or oscilloscope to track down the oscillator signal or its absence. A little pocket radio can do pretty much the same thing. You can how here. If, however, you want to grow your pile of stuff, there are plenty of ways to do that. Some of these things you can even make yourself. It's also handy to have piercing probes. These sharp-pointed devices let you get to the wire beneath insulation so that you can take measurements when it would be otherwise difficult or impossible to reach either end of the wire. Speaker substitution It is also useful to have a cable with an earphone plug on one end and alligator clips on the other, or better yet, a small speaker in an enclosure with such a cable attached. Handy DIY speaker substitution box. I built it using an old Philco radio case and speaker. It has three ways to contact suspect radios to the test speaker—a standard earphone plug, a mini earphone plug and alligator clips. 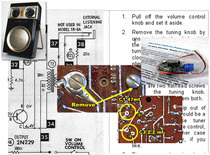 This combination can help you troubleshoot radio speakers even before you open the case. Those test plugs on the side of the case let me connect a voltmeter to the output of the radio. This is useful when performing alignments. 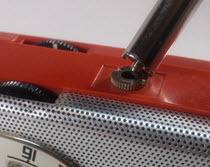 That toggle switch disconnects the test speaker and substitutes an 8Ω resistor so that no one needs to listen to the radio noises while aligning.